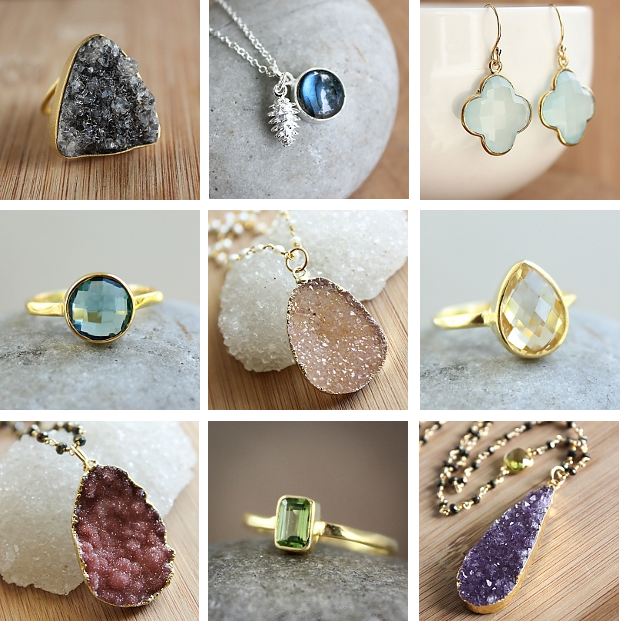 Vancouver-based OhKuol is a handmade gemstone jewelry line I can get excited about. Most handmade gemstone jewelry lines tend to involve delicate, beaded things, whereas my taste these days veers toward statement baubles. OhKuol's creators Vi and Priscilla Phan, on the other hand, have wisely decided to keep their quartzes, citrines, druzies, and various other gems big and bold, letting the stones' beauty shine through in modern bezel settings crafted from gold and silver vermeil. The result is a jewelry line that bridges the gap between costume and keepsake. And the best part? Most pieces are under $100. Let the browsing (and the drooling) begin. Lovely! I really like pieces like #2, 3, 4, 6, 8. And under $100 .. that's quite a bargain! Isn't it? Especially considering the materials and provenance.